A protester holds a sign outside of a Phoenix office building Wednesday. A local artist staged a protest at the building after a Reveal story about a government contractor, MVM Inc., holding immigrant children in the building, some overnight, under its contract with U.S. Immigration and Customs Enforcement. 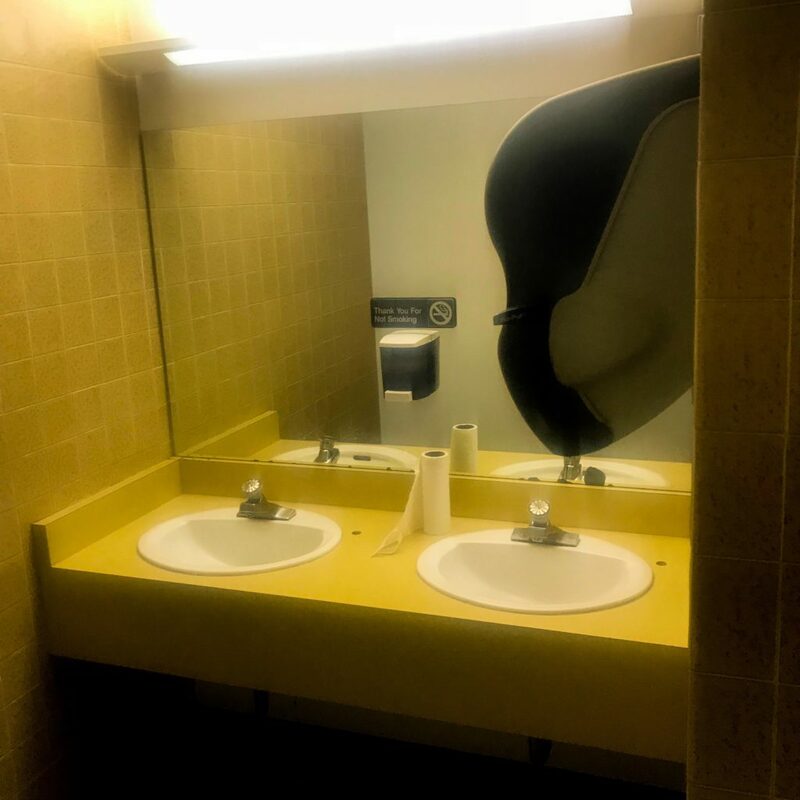 An insurance executive told Reveal he had seen the children bathing in sinks in the office's shared bathroom. 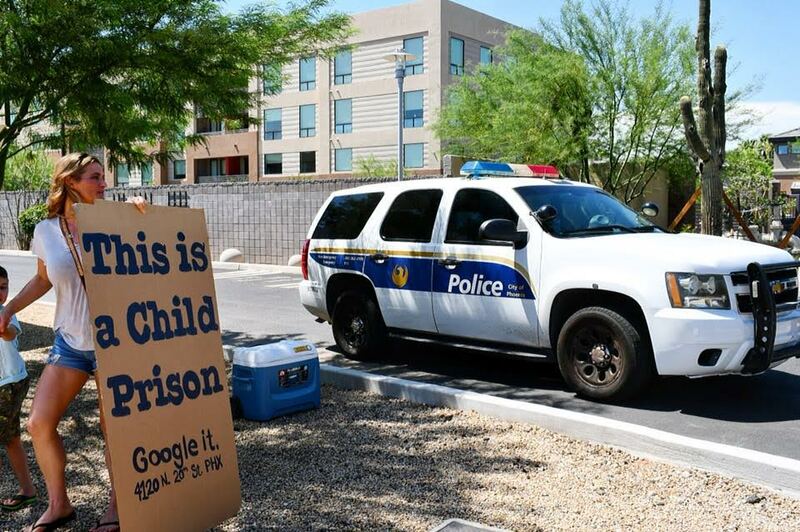 Hours after a Reveal investigation was published, a government defense contractor cleared out the Phoenix office space where it had detained immigrant children, where some were held overnight and others were seen bathing in office sinks. Two Arizona lawmakers also called on the state to immediately investigate whether Virginia-based MVM Inc. is violating state law in keeping children in unlicensed office buildings, with one vowing to sponsor a new state law to halt the practice. MVM has a contract with U.S. Immigration and Customs Enforcement to transport immigrant children to airports and shelters across the nation. MVM is the primary transportation contractor for the federal government’s court-ordered efforts to reunify families separated under President Donald Trump’s zero tolerance policy. ICE has filed a plan of operations for the reunification of families whose children are ages 5 to 17. In it, the agency says it will “coordinate with MVM to dispatch” those families. However, an investigation by Reveal has raised questions about MVM’s treatment of children. The company has detained dozens of children, including some separated from their parents, in leased office spaces that have no kitchens, bedrooms, showers or yards. One teenager transported to a Phoenix office site by MVM ran away and has not been found. First responders were called to check on another who was having breathing problems. According to a floor plan, the first Phoenix site did not offer a way to separate boys and girls or younger children from older ones. One video shot by a neighbor at the second site showed one boy shoving another as a younger boy, who appeared to be under the age of 5, walked nearby. After Reveal published a story early Tuesday about a second office site leased by MVM where children were detained, workers were seen clearing out the office space. A photo provided to Reveal showed the office is now empty except for a fan, a wall-mounted television and a hand truck. MVM’s spokesman has confirmed that some children stayed overnight in the buildings. He called that a “regrettable exception” to company policy. A spokeswoman for ICE has said the agency is reviewing whether MVM has complied with its ICE contract to transport children but neither she nor the contractor would provide copies of that contract. MVM has received contracts worth up to $248 million to transport immigrant children since 2014, records show. The company, which once provided guards for CIA facilities in Iraq, was founded by three former Secret Service agents. One of its vice presidents is a former CIA special agent and former acting director of the U.S. Marshals Service. Butler also said she disagrees with Arizona Department of Health Services Director Cara Christ’s contention that the company does not have to comply with state child care licensing laws. The two lawmakers called on Christ to further review MVM Inc.’s treatment of children in its custody. “We request your review on whether sanctions against MVM are warranted due to the company’s admitted use of the Osborn and 20th Street office space as unlicensed child care facilities. We believe ADHS has the authority under our current statutes to investigate MVM and enforce current licensure requirements,” Butler and Engel said in a letter Wednesday to Christ. Steve Farley, Arizona’s Senate assistant minority leader, joined officials calling on the state to take action. Farley is also a Democratic candidate for Arizona governor. Farley noted Reveal’s story included statements from an insurance executive, Bill Weaver, who said he saw immigrant children bathing in sinks in the small bathroom Weaver and other adults shared with the MVM office. “Arizona state law also says that the Department of Health Services, when they get allegations of an unlicensed day care where kids may be mistreated – and I would say bathing in sinks is a mistreatment – that it is the obligation of the Department of Health Services to report this to the attorney general or the county attorney and demand an immediate injunction and restraining order so that they can stop doing their business,” Farley said. A small group of citizens staged a “silent protest” outside the building Wednesday. Local artist Caitlin Clifford, who organized the protest, said she planned to return to the building on 20th Street Thursday afternoon. “We have chosen to do a silent protests because we want passersby to find us approachable,” Clifford told Reveal. Ziva Branstetter can be reached at zbranstetter@revealnews.org. Follow her on Twitter: @ZivaBranstetter.